In a recent update, the developers behind Crossout confirmed what many people who’ve been following the game have been waiting for: it’s going to be entering open beta with its next update. Can’t wait for this free MMO to come out? Don’t worry, there’s plenty more, and we’ve got them covered. It currently costs £24.99 (or your regional equivalent) to get into the closed beta of Crossout, but when the next update hits, the game will fully transition into open beta, and its free-to-play stage. Developed by Targem Games (who have made a lot of other car combat games) and published by Gaijin Entertainment (the folks behind War Thunder), Crossout describes itself as a “post-apocalyptic MMO action game”. Lots of rusted metal, loud engines, grimy guns, and a few cars with chainsaws attached, because why not. The game will still be an open beta, though, and therefore unfinished, but it’s currently got much of the foundations in place: PvP and PvE battles or missions, plus systems for putting vehicles together with parts you can buy or sell. If you’ve already been playing, the game will, unfortunately, be resetting all content when it enters open beta, so don’t take this as an opportunity to get started early. Vehicles bought with real money will stick in players’ garages, but otherwise, it’s all gone. 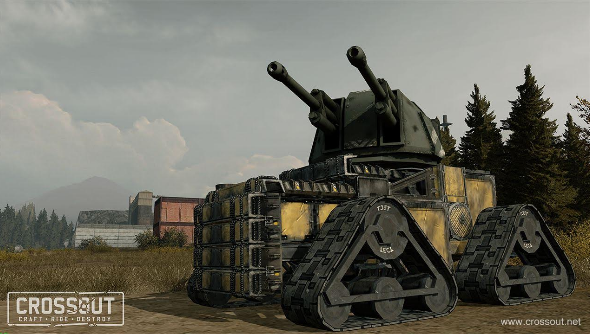 The team are planning to reward those who’ve been there since before the open beta test, though, with in-game paint cans and portraits, plus a free vehicle called “Snappy”. Unfortunately, it’s not shaped like an alligator. You can see more about the game on its Steam page.